When people think about the “energy transition” in Germany and elsewhere, they tend to think of the success of solar and wind power. However, of all forms of renewable energy it is biomass that has seen the largest absolute growth and supplies by far the most renewable energy, writes Robert Wilson. In Germany biomass has grown three times as much as wind and solar combined. 17% of the country’s arable land (6% of total land) is now devoted to crop-based fuels: “a remarkably inefficient use of land”. Wilson calls for a debate on whether and how Europe should continue to promote biomass. If I asked you to think of renewable energy what comes to mind? I imagine it is skyscraper-sized wind turbines, solar panels on suburban roofs or massive hydro-electric dams. You probably do not think of burning wood or converting crops to liquid fuel to be used in cars. Yet throughout the world bio-energy remains the biggest source of renewable energy. 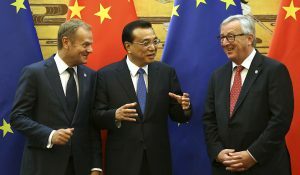 In fact its growth in the last decade has been greater than or similar to that from wind and solar in most places, and those places include the European Union and the United States of America. The Industrial Revolution was fundamentally an energy transition from burning biomass, mostly wood, to burning coal. Despite being called a revolution this was a rather protracted affair. America did not get the majority of its energy from coal until the 1880s, while China and India remained predominantly biomass powered until the 1950s and 1960s. And many countries, or regions within countries, still remain highly dependent on energy from biomass. This transition from burning biomass to burning coal occurred first in Europe. By the mid-eighteenth century England was getting most of its energy from coal, and by the mid nineteenth century biomass was in long term decline in Western Europe. However this decline did not start until the mid-twentieth century in Eastern Europe. 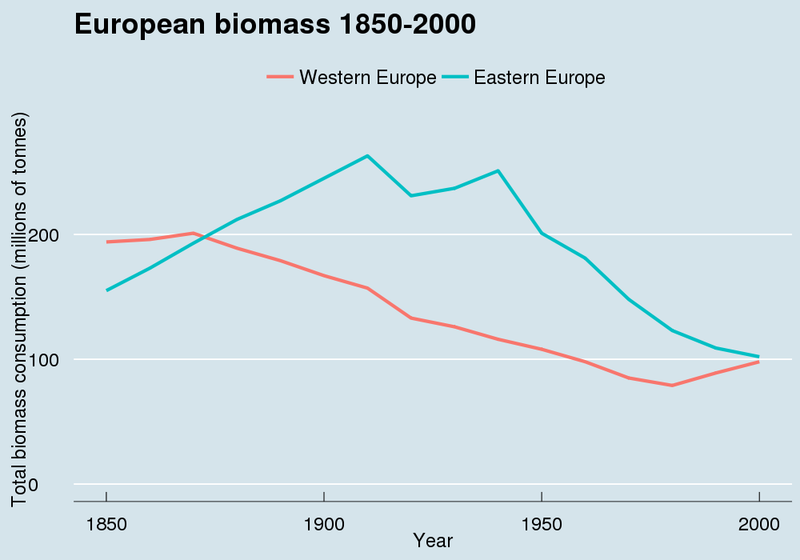 This long term trend however has been reversed, and biomass is now seeing some form of renaissance in Europe. The reason for this is simple: renewable energy targets, and subsidies. In 2007 the European Union decided that it should get 20% of its final energy consumption from renewables by 2020. However looking at the available options countries quite clearly decided that wind and solar were not ready to be scaled up to the desired level that quickly. They turned to the oldest form of energy available: biomass. 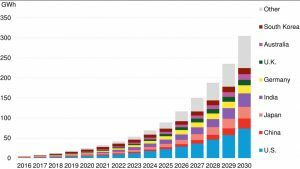 Despite what many perceive, the renewable energy target has, so far, lead to a far bigger expansion of bio-energy than wind and solar energy. 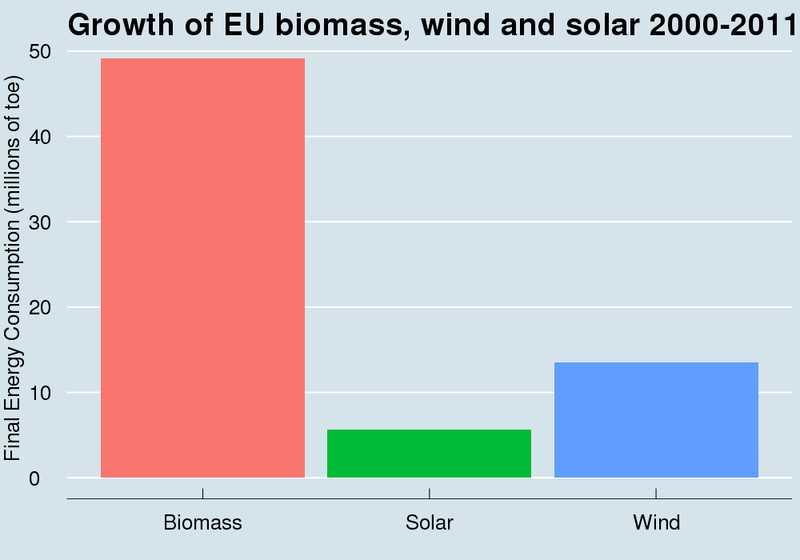 In 2000 biomass was by a significant margin the biggest source of renewable energy, and made up more than half of final energy consumption in the EU. As the graph below shows this dominance of biomass was still very much the case 11 years later. The inclusion of hydro-electricity in the graph above is merely an obligation. Most EU countries have stopped building any hydro-electric capacity, so its growth over this period was essetnially zero. The same holds for geothermal energy. 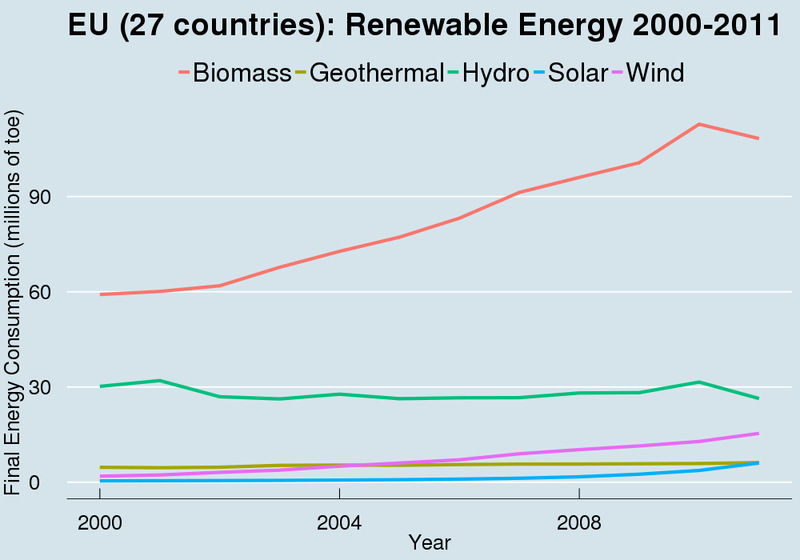 Growth of renewable energy since 2000 therefore only really came from three energy sources: wind, solar and biomass. In percentage terms the two energy sources that saw the most rapid growth were wind and solar. This is unsurprising, given their low starting point. However in absolute terms biomass is the clear winner. Between 2000 and 2011 biomass grew by 49 million tonnes of oil equivalent (toe). Wind and solar only grew by 13 and 6 million toe respectively. In other words the absolute growth of biomass was 1.5 times greater than in wind and solar, and so far the majority of new renewable energy since 2000 has come from biomass, not wind and solar. Biomass is also the biggest source of renewable energy, on a final energy consumption basis, in all but two EU countries. The exceptions are Cyprus and Ireland. Denmark may get 30% of its electricity from wind farms, but it still gets more than twice as much of its final energy consumption from biomass than from wind farms. The supposedly rapid expansion of solar power in Germany gets a lot of attention. The even more rapid expansion of biomass however has received absolutely no attention. Final energy consumption from biomass grew by 16 million tonnes of oil equivalent between 2000 and 2011, while wind and solar grew by 3.4 and 2.1 million toe respectively. 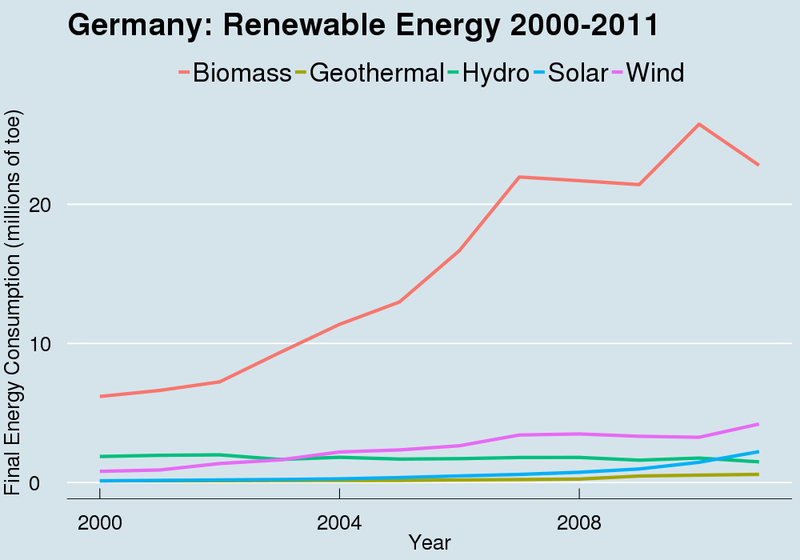 Absolute growth of biomass in Germany has therefore been three times higher than for wind and solar combined. The increase in bio-energy in Germany has taken many forms. For example wood-chip heating systems have grown massively since 2000. In a decade Germany went from burning almost no wood-chips for heating to burning 1.2 million tonnes each year. Germany also now gets a significant portion of its electricity from bio-energy. In 2013 bio-energy was used for almost 7% of its electricity production, higher than that from solar PV and just short of that from wind power. Electricity generation from bio-energy receives approximately 4.5 billion Euros in subsidies each year, 30% more than is received by onshore wind in Germany. However wood, not crop-based biofuels, is the biggest source of bio-energy in Germany. A total of 53 million cubic metres of wood is used each year for energy generation, which is 41% of the total annual German wood harvest. This corresponds to approximately 4% of Germany’s total energy consumption, a figure that has more than doubled in the last decade. This then is a rather different picture of the renewables revolution happening in Germany. 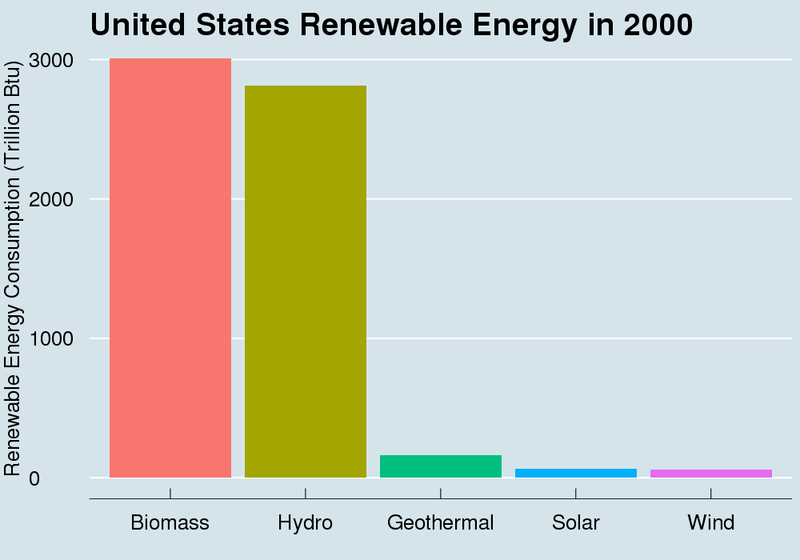 Here was the position in the United States in 2000: almost all renewable energy came from hydro-electricity and biomass. Biomass provided 49.2%, while hydro-electricity provided 46%. Of that provided by biomass 76% was from wood, 17% was from waste and only 7.8% was from liquid biofuels. Negligible quantities were derived from geo-thermal, solar and wind energy. However the early 21st-century saw the mass-subsidisation of corn ethanol and today almost half of bio-energy comes from liquid biofuels. The conversion of food crop into fuel is nothing new. Rudolf Diesel ran some of his earliest engines on crop-based fuels. However the scale of the conversion of corn into fuel in the United States in the last decade and a half is something new. In 1980 only 0.7% of US corn consumption was used for producing fuel. By 2000 this percentage had reached 8%, but last year it reached an astonishing 43%. Between 2000 and 2013, total growth of renewable energy consumption from liquid biofuels was almost identical to that from wind and solar combined. 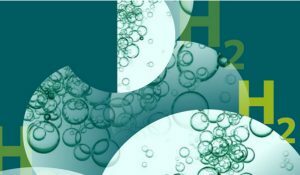 Liquid biofuels grew by 1768 trillion Btu, from 233 to 2001 trillion Btu, while wind and solar combined grew by, 1820 trillion Btu, from 95 to 1915 trillion Btu. In the 21st-century growth in US renewables was essentially restricted to the three previously mentioned energy sources: liquid biofuels, wind energy, and solar energy. As in Europe, there was practically no new hydro-electricity capacity and very little new geothermal capacity. This then is where the US was last year. Biomass still provides almost half of renewable energy, but now provides almost two times more than any other source of renewable energy. 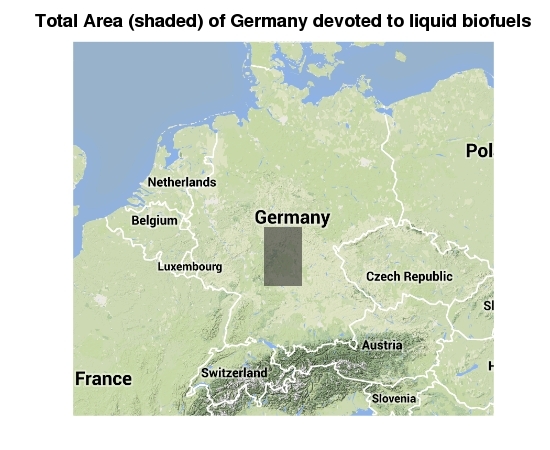 As in Europe the land required to produce liquid biofuels is significant. Last year a total of 95 million acres was used to produce corn. This produced 14 billion bushels of corn, of which 5 billion were used for corn ethanol production. So approximately 140,000 square kilometres of America is now used to produce corn ethanol, which is 1.4% of American land. However based on official government statistics only 1.1% of US primary energy consumption comes from corn ethanol. These power densities of energy production can then be compared with the power density of energy consumption. In many densely populated affluent economies, such as the UK, Germany and Japan, this is above 1 watt per square metre. In other words powering these economies purely with biomass will require more than two times more land than they have. A similar calculation can be made with corn ethanol in the US. Moving to 100% corn ethanol would require a land mass of roughly the size of the US to be converted over to corn ethanol, a very unlikely prospect. Physical realities therefore mean that it is implausible that bio-energy can provide anywhere close to the majority of the energy needs of affluent economies. And whether the large-scale expansion of bio-energy is desirable is increasingly questionable. The expansion of corn ethanol and bio-diesel around the world has lead to a significant diversion of cropland over to biofuel production. Some commentators have referred to this a “crime against humanity,” a perhaps justifiable claim given the potential impact this has had on global food prices. Similarly the environmental benefits of biomass are increasingly in doubt. The expansion of cropland to accomodate liquid biofuels production has almost certainly resulted in large amounts of de-forestation, and the carbon released during this has quite probably offset whatever emissions are supposed to be saved by the biofuels in the first place. Liquid biofuels also have very problematic energy returns on investment. If you want to grow crops you will need to dump fertilizers on fields and these fertilizers are produced using fossil fuels. For these and other reasons the carbon dioxide used to produce corn ethanol may not be that much different from the carbon dioxide emissions they apparently save. Environmental groups are also increasingly opposed to the large-scale expansion of bio-energy. A recent report from Friends of the Earth and Greenpeace suggested that getting electricity from burning wood may be worse than getting it from coal. And there is now an ongoing argument between many British environmental groups and some renewables lobby groups over the issue. Subsidies and mandates for liquid biofuels are also now routinely opposed by many environmental NGOs. “Advanced” biofuels however may solve some of these problems, or they may not. 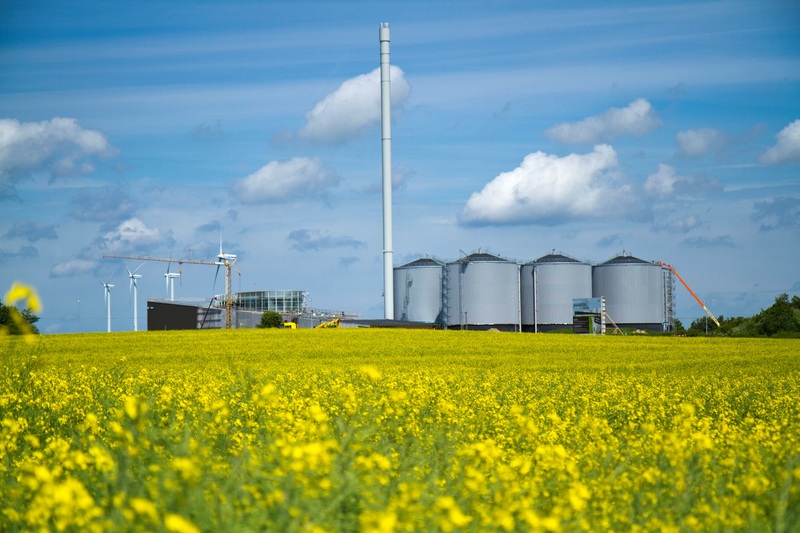 And a recent reportclaims that cellulosic biofuels may become cost-competitive – there is always a report saying a technology will become cost-competitive by a particular date – by 2016. 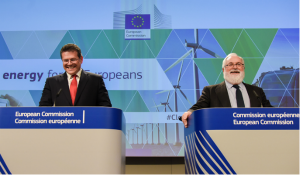 The recent IPCC WG3 report on climate change mitigation also gave what could be called a qualified thumbs-up to both large-scale bio-energy and bio-energy with CCS. These forms of enerby conversion therefore may become a vital part of our attempts to combat climate change. However whether they will, or whether we should even try, ought to be a matter of important debate. 1. EU renewable energy statistics come from Eurostat. 2. 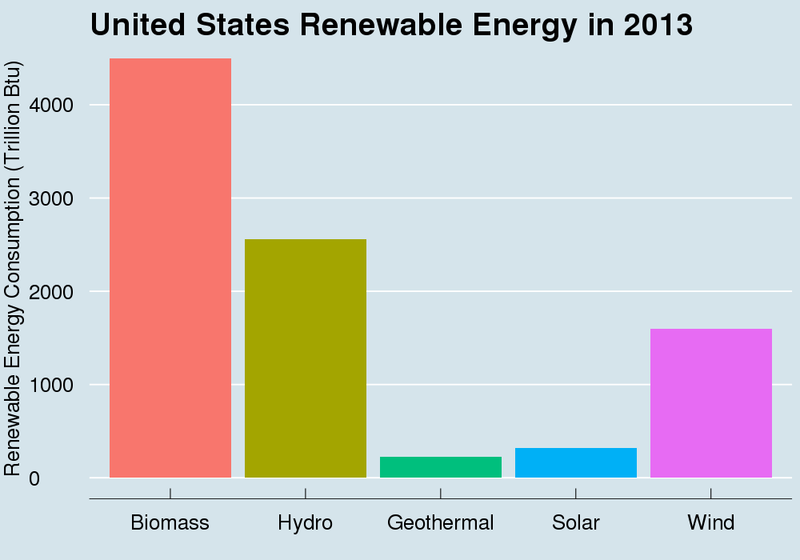 US renewable energy statistics come from EIA. 3. EU statistics are in terms of final energy consumption, whereas US statistics are in terms of primary energy consumption. I explained the difference between these in a recent article. I use the units used by the official statistical bodies. In the US case it is the British Thermal Unit, which Americans continue to use in an ironic post-colonial fashion. 4. Estimates for European biofuel use from 1850-2000 are taken from Fernandez et al. 2007. These statistics are in tonnes of biomass, so are not directly comparable with the other measures. 5. US total energy consumption statistics are taken from EIA. 6. US corn acreage and corn use statistics are from USDA here and here respectively. Once again we have units that are scientifically indefensible, but things are what they are. 7. German electricity production statistics can be found here. It’s in German, but the German for biomass is biomasse. 8. 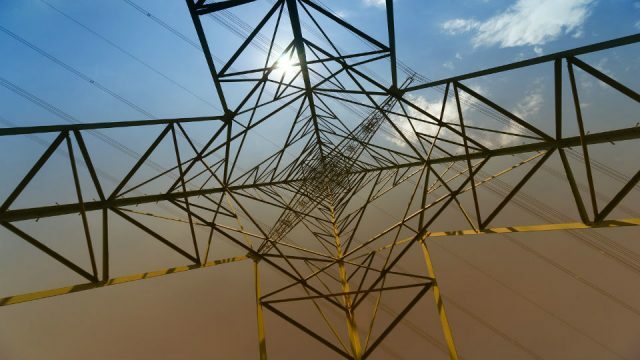 Vaclav Smil’s primer on power density is an excellent introduction to the spatial requirements of energy generation. Robert Wilson is a PhD Student in Mathematical Ecology at the University of Strathclyde in the UK. His secondary interests are energy and the environment. His website is http://carboncounter.wordpress.com/ He maintains a blog at the website The Energy Collective where this article was first published. It is reproduced here with permission from the author. Great article Robert Wilson. It is enough to make a grown man cry. Writing from what happens in the U. S., one can make a case residents from Bedlam have developed the U. S. energy policy. Take ethanol from corn. Cornell University Prof. David Pimental published it takes 1.29 Btu of energy to make 1 Btu of ethanol from corn energy. You have to evaluate ethanol from the field to the gas tank in energy consumption. Corn is a debilitating crop and requires much fertilizer and water to produce it. You have to harvest, make ethanol, and ship it by vehicles because it ruins pipelines. Naturally it ruins two-cycle engines and a host of other applications. It is true our 12 billion gallons of ethanol produced equals 1.1 percent of U. S. energy consumption; but it required 1.3 percent of our energy to make. On top of the 5 billion bushels of corn used to make alcohol, I believe we waste 1 billion bushels of soybeans each year to make biodiesel. Its power density is even worse because you get about 60 gallons per acre as opposed to 360 gallons per acre with corn. In terms of energy, ethanol produces about 30 million Btu per acre annually. For what it is worth, solar panels are a far more efficient use of land than biofuels. It takes about 6 acres for a 1 Megawatt solar farm that on sunny areas can produce 1700 Megawatt-hours per year. This gives 300 Megawatt-hours annual or 1 billion Btu per year per acre. Electrical energy is worth more than heat energy because it take 2.5 Btu of heat to make 1 Btu of electrical energy. You get 3 miles per kilowatt-hour for electricity and maybe 30 mpg with ethanol. So an acre of solar panels can propel a car 1 million miles; while an acre of corn will propel a car 10,000 miles. It takes energy to make solar farms and my estimate the solar farm must operate 6 years before it has a net energy output. Your guess is good as mine on the lifetime of solar panels. I have seen guesses of 20 years to 40 years. Needless to say, electricity from solar panels or wind farms is going to be very expensive because it is unreliable and present only a small fraction of the time. The U. S. got started on this path to economic ruin when President Carter proclaimed “gasohol”, ethanol from corn, is going to solve our energy problems. We proceeded with spending trillions of dollars on energy sources that realistically produce maybe 2 percent of our energy production. Remember, ethanol did not produce any energy. I forgot to mention in the previous post I am uncomfortable using the word density when describing something per square meter or square foot. Densities are unit volume or cubic meter or cubic foot. Thus a better term for watts per square meter might be power flux. to stop conflating it with solar and wind, must you treat your readers as though they don’t know what you just learned? You speak of deforestation; you are aware that the forest area in Germany is growing, not shrinking? The word “biomasse” might be French, but it can’t be German; all German nouns are capitalized. Otherwise, your assessment of biomass is very much to the point. Thanks for repeating the news. Craig Morris> You speak of deforestation; you are aware that the forest area in Germany is growing, not shrinking? on the other hand: are You aware of the difference between a tree-farm and a forest? And have you checked how much of the biomass burned in Germoney is imported ? Thanks for the excellent post, I would very much agree. Campaing groups like BirdLife Europe and the European Environmental Bureau are working hard to do exactly what you’re proposing: start a debate on the role of bioenergy in the EU’s new climate and energy policy framework for 2030. Thanks for the article which i find highly interesting, and even enlightening. Where do these “2%” in “biofuels … produce around 2% of Germany’s total energy consumption” come from ? The world energy consumption increases every year. What is the reason? Probably the main cause is production of renewable energy from biomass. A car consumes 100 gasoline units provided with an energy return on investment (EROI) of 4.25. Than the overall fossil energy consumption is 100+100/4.25=124 fossil energy units. 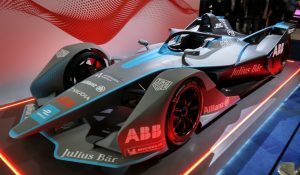 If the energy input is limited to 124 to maintain the same CO2 emission level, about 21 (124=20.7+20.7/0.2) renewable energy units – that is about 1/5th – remain at the car owners disposal. If we replace 100 gasoline units by ethanol produced from sugar cane with an EROI of 0.2, than the overall energy consumption of renewable energy is 100+100/0.2=600 renewable energy units. Facit: biomass as source for fuels (solar energy conversion efficiency of biomass via photosynthesis is about 0,1% – 1%) is never competitive in terms of energy efficiency with non biomass renewable techniques converting solar energy into fuel.